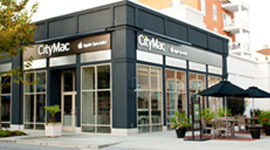 Challenges were presented early on as this project began to build momentum. 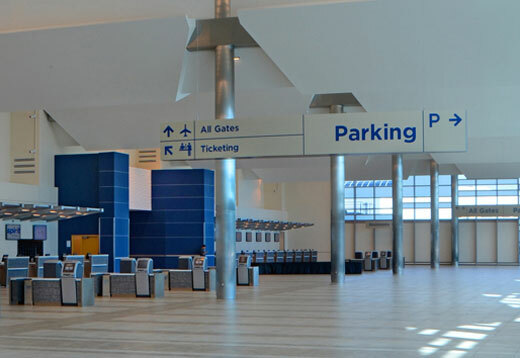 As the terminal expansion was taking place, the existing terminal was continuing to be very active and every action was taken with that and safety of both contractors and passengers in mind. 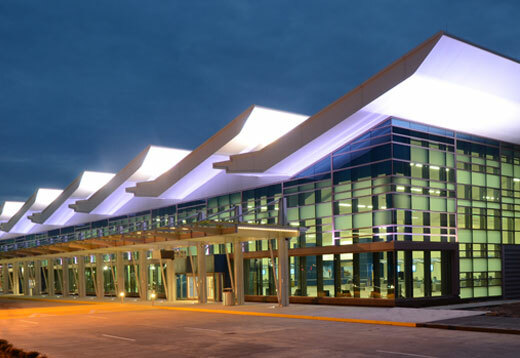 The magnitude of the package was very extensive at nearly 500 signs for the new terminal alone and every detail was checked and re-checked as not to cause unnecessary delays at the close of the project. 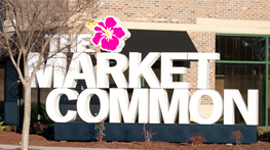 The Main entry sign took a combination of engineering and experienced fabricators to build a structure at our facility in Myrtle Beach, to house the custom formed radius resin panels manufactured in the mid-west, and have everything fit perfectly and illuminate without hindrance. Lastly, a solution had to be developed to safely suspend signs above the ceiling, without interfering with other critical systems. 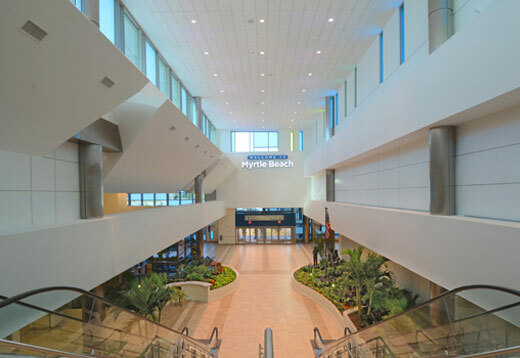 Extra care and coordination was taken in the placement of the cabling sequence above the ceiling that the 30 signs suspended from throughout the terminal. 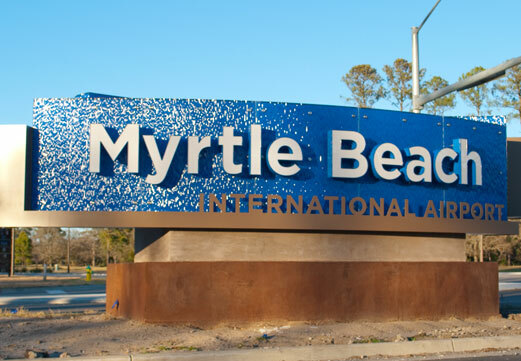 Tyson Sign Company was chosen by the Horry County Department of Airports to execute the production and installation of a complete signage and way finding package for the Myrtle Beach International Airport expansion and renovation. 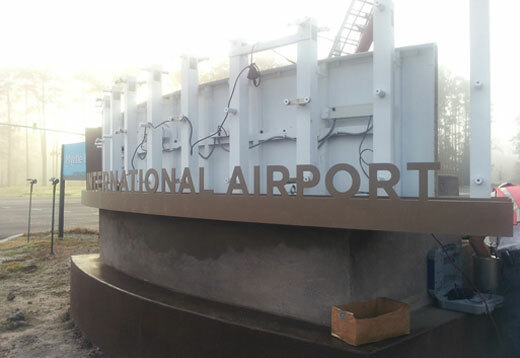 As you approach the new terminal, a monument at over 8’ tall and over 23’ long, the new Main ID sign for the airport begs for attention. Starting with a tinted and radius formed concrete base that leads up to 2 custom fabricated radius sign cabinets. The face of each cabinet is comprised of LED illuminated, custom formed, Cobalt Blue, wave resin panels with attached individual LED channel letters. 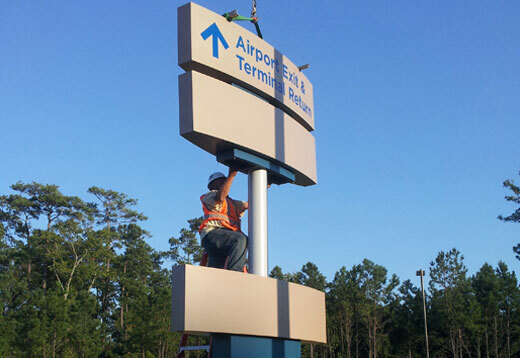 Making your way towards the new terminal, free-standing and monolithic terminal access road signs from 5’ to 14’ lead the way, all maintaining matching radius faces and pole covers, and utilizing reflective blue applied vinyl copy. 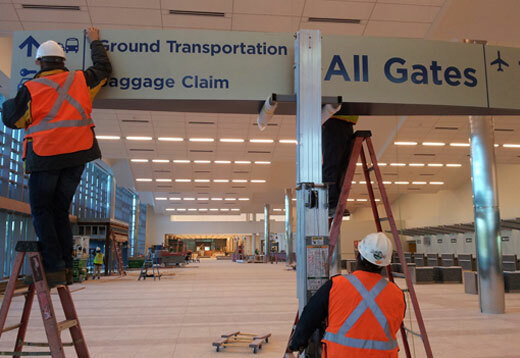 As you enter the Airport’s new facility, you are welcomed by a full interior sign package ranging from 1’ x 5’ custom fabricated wall signs to an array of double sided radius face signs up to 16’ long, suspended by stainless steel aircraft cable, from ceilings topping out at 60’. 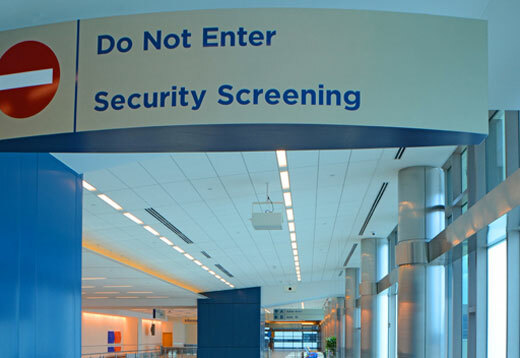 Each baggage claim carousel is identified by a 2’ x 3’ flag mounted sign extending from stainless steel wrapped column and has an LED illuminated 1” white acrylic push through face with translucent blue applied vinyl. 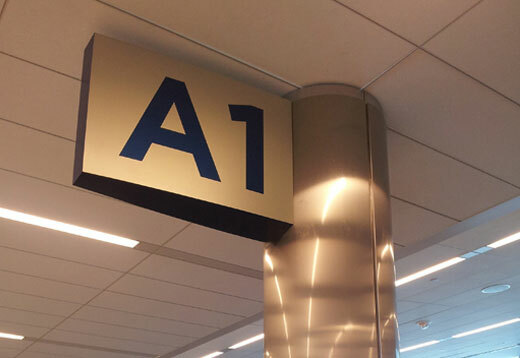 On the concourse, each gate is located with non-illuminated column mounted signs similar to the signs identifying baggage claim along with gate door signs, 2’ x 4.5’, with radius sides and LED illuminated, white acrylic, push through numeral faces. Finally, each doorway in the newly constructed airport is accompanied by an ADA compliant plaque. 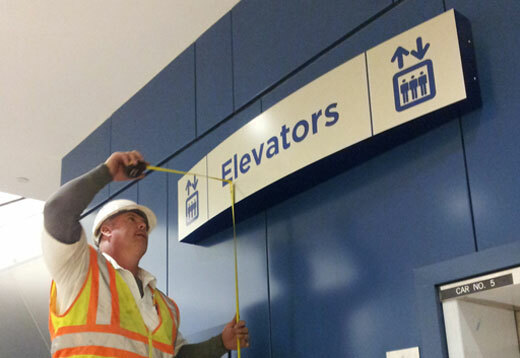 Each plaque consists of a clear acrylic lens with raised letters and braille characters, with electric blue metallic vinyl applied 2nd surface, all attached to a brushed aluminum backer. 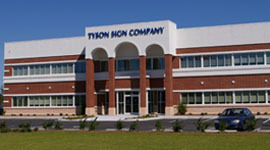 Tyson Sign Company worked for over a year from beginning to end with the owner, architect, and sign consultant to ensure that the local community and visitors from all over the world recognize and remember Myrtle Beach as a top destination.